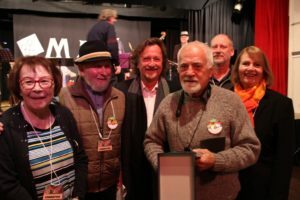 The recipient of Merimbula Jazz Festival Annual Award is a muso whose has made a significant contribution to the festival over a period of time. Its a “whos who” of some of the great musicians who have made the Merimbula Jazz Festival the wonderful event that it is. 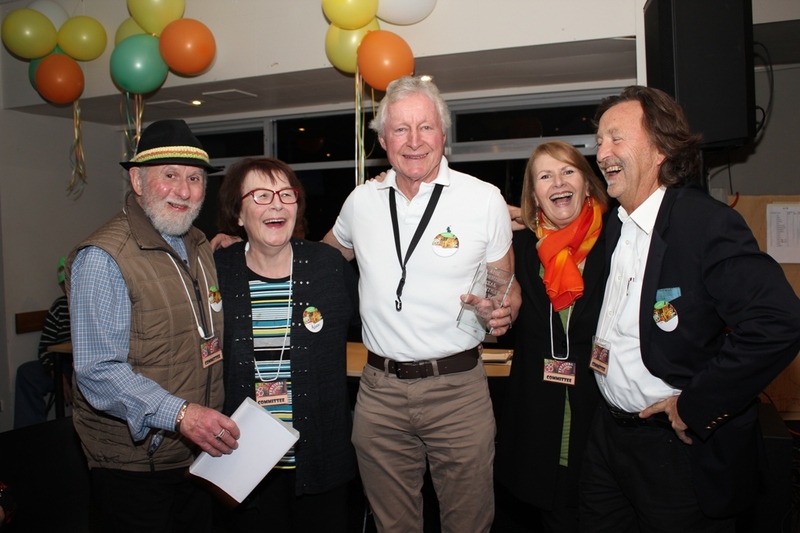 The Merimbula Jazz Festival Award is presented annually to someone who has contributed to the ongoing development and longevity of jazz music, in all its various forms, and the continuing patronage of jazz festivals. 2018 WINNERS – ROGER CLARK and BOB PORTER. Roger Clark has performed at the Merimbula Jazz Festival on a regular basis since 1992. He has always encouraged Melbourne’s best musicians to attend the festival and his performances are a much appreciated major attraction. Thank you Roger. Alto Saxophonist Roger Clark has had a long and illustrious career in jazz. Starting out at age 17 cutting records with the legendary pianist Bob Sedergreen he has gone on to play with the who’s-who of jazz. Having sold his pushbike at an early age to buy his first alto, he has worked throughout his musical career to emulate bop legends such as Charlie Parker and Phil Woods. He is an accomplished player whose parameters remain tied to orthodox bop language. He has developed his own sound, making the most of the dynamic contrast and colour in his own playing, while allowing each member of the rhythm section their own space. He started Dizzy’s Jazz Club in 1998 which is one of Australia’s premier Jazz Clubs that hosts live music five nights a week. Roger is a leader in the jazz scene starting the Dizzy’s Big Band which kick-started the musical careers of some of Australia’s leading musicians including Eugene Ball, Toby Mak, Cam McAlister, Jordan Murray, David Rex and Anton Delecca as well as many others. He has also played with some of the leading international vocalists and musicians of the twentieth century including 20 years with US ex-pat trumpeter Gil Askey (Four Tops, Supremes, and Stevie Wonder); US Trombonist, Allen Hermann & US Trumpeter, Bob Montgomery as well as concerts with US Vocalists – Lynda Lawrence (Supremes) and Salena Jones (Downbeat Vocalist of the year 1964 – alongside of Peggy Lee, Ella Fitzgerald and Nancy Wilson). I formed ‘Jazz Interlude’ with some regular work at the University Union. Shortly after I joined ‘The Fat Cat City Five’ (with Norm Simms) playing at the Contented Soul in Woden. 1981 departed Canberra for Christmas Island and put the clarinet down for a couple of years. Then back in Canberra unsettled and played little until 1987 when contacted by Jiri Kripac and David Bates who were doing cabaret with ‘Madam’ Pat Thompson. 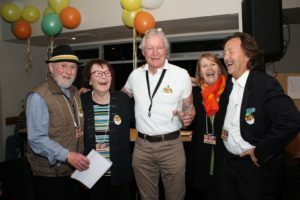 I joined them a couple of times at Tilly Devine’s in Canberra and got the opportunity to go to Europe and the Edinburgh Festival with Pat’s Rent Party Band. So took a year off teaching to do some woodshedding and touring with Pat, mainly in Victoria before departing for Germany. 1988 back teaching unsettled in Canberra moved to the South Coast. Was contacted within 24 hours to play a wedding with what was to become the Down South Jazz quartet. The local jazz club had virtually folded so we (DSJQ-Bill McLean,Walter Brunton,John Moffatt) took the name up for our venue at the bottom pub Pambula and kept the name and club banner alive for the next few years(decade?) The quartet over the next 20 years played Festivals around the Eastern part of Australia courtesy of Moff’s aeroplane and skills. This included several appearances at the prestigious Thredbo Festival, Manly Festivals and Norfolk Island festivals. The Down South Quartet devolved and since than I have played off and on with Banjo Bev Long from Tilba. Lately with “Jazz Alley” (Dear friend John Cursley has recently left us so the future is a little uncertain) I have also been joining ‘Captain Bob’s Stationhouse Seven’ (Wollongong) on a regular basis.